Mr. Michael R. Del Ponte, passed away Sunday afternoon, June 26, 2016 at his home in Cedar Grove after battling ALS. He was 53 years old. Mike was born October 20, 1962 in Fond du Lac, the son of Melvin and Roseann (nee Roltgen) Del Ponte. After high school, he earned a degree in electrical engineering from MSOE. On September 13, 1986, he was united in marriage with Holly Cibulka at St. Mary’s Church in Eden. For 27 years, Mike worked as an engineer for GE Healthcare, and retired in 2014. Mike was a member of Divine Savior Parish, and had served on the St. Mary Lake Church Parish Council. He enjoyed hunting, running and woodworking. 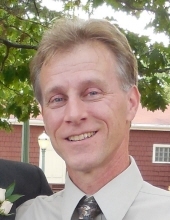 Mike is survived by his wife Holly and 4 daughters: Heather Sakalowski of Libertyville, IL, Sarah (Tony) Jazdzyk of Milwaukee, Kelly Del Ponte of Cedar Grove and Tammi Del Ponte of Cedar Grove. He is further survived by his grandson Alan, his father Melvin Del Ponte of Fond du Lac, siblings: David (Sue) Del Ponte of Germantown, Patrick (Ann) Del Ponte of Menasha, Raymond (Linda) Del Ponte of Germantown, Paula (Dale) Brath of Fond du Lac and Peggy (Thomas) Gerrits of Hubertus, mother and father-in-law Constance and Gabriel Cibulka of Waldo, siblings-in-law: Eric (Kim) Cibulka of Kewaskum, Lisa (Robert) Stinson of Chula Vista, CA, Connie (Terry) Etta of Kewaskum, Deborah (Jeff) Anderson of Kewaskum and Julia (Chris) Stoffel of Plymouth, nieces, nephews, other relatives and many friends. He is preceded in death by his mother Roseann. A Mass of Christian Burial will be celebrated at 5PM on Thursday, June 30, 2016 at Divine Savior Parish, Holy Cross Chapel, 5332 Hwy B. in Belgium. Father Todd Budde will officiate. The family will receive visitors at the church on Thursday from 3-5PM. Mike will be laid to rest at St. Mary Parish Cemetery in Lake Church. The Eernisse Funeral Home, Belgium is honored to be assisting the family with arrangements. The family would like to thank the staff of Sharon S. Richardson Hospice for their compassionate care over the last year. To send flowers or a remembrance gift to the family of Michael R. Del Ponte, please visit our Tribute Store. "Email Address" would like to share the life celebration of Michael R. Del Ponte. Click on the "link" to go to share a favorite memory or leave a condolence message for the family.